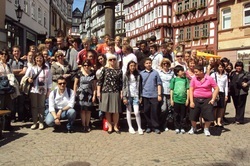 Marburg - GERMANY - Welcome to our Comenius Project Website! From May 28th to June 1st we participated in the third Comenius meeting in our project. This time our neighbours from the western border were the hosts of the meeting.During our stay in Marburg we visited many places connected to our current Comenius topic: environment. These were: E.ON power station, self-sufficient solar factory and passive solar office building. We also discussed many possibilities in which we can care about our environment ourselves.The German Comenius team also took us to Edersee lake and invited to a cruise, which allowed us to contempt the beauty of Hessen.Our students had a chance to find new friendships among their peers in different countries and practice their English in everyday situations.